Are the R179's in service getting an upgrade for this or are they gonna have no CBTC? 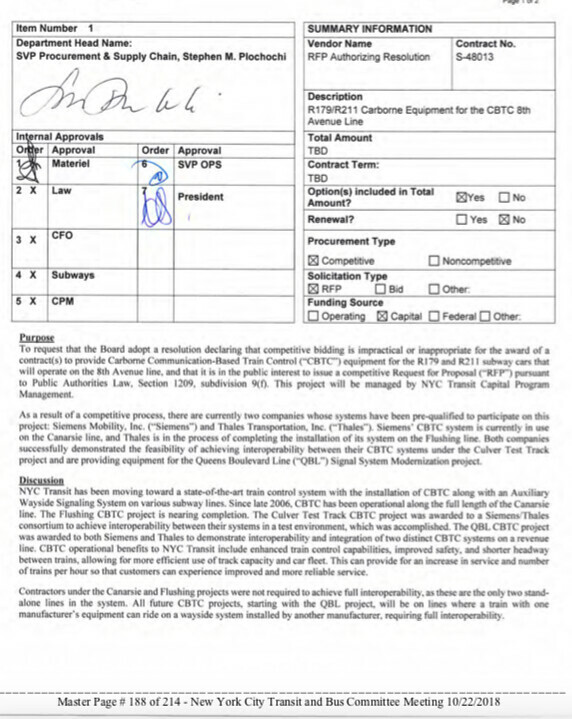 CBTC R211s on 92 5-car sets under the base contract, 128 5-car sets under Option 1, and 89 4-car and 5-car sets under option 2. There is no way to have 89 sets and 333 cars if the sets are a mix of 4-car and 5-car units, meaning that they will go with the high number. 89(4) = 376, which is already more than the minimum. Therefore, there will be 77 sets of 5-car units, and 12 sets of 4-car units, making 385 cars in 5-car sets, and 48 cars in 4-car sets, all equipped with CBTC. 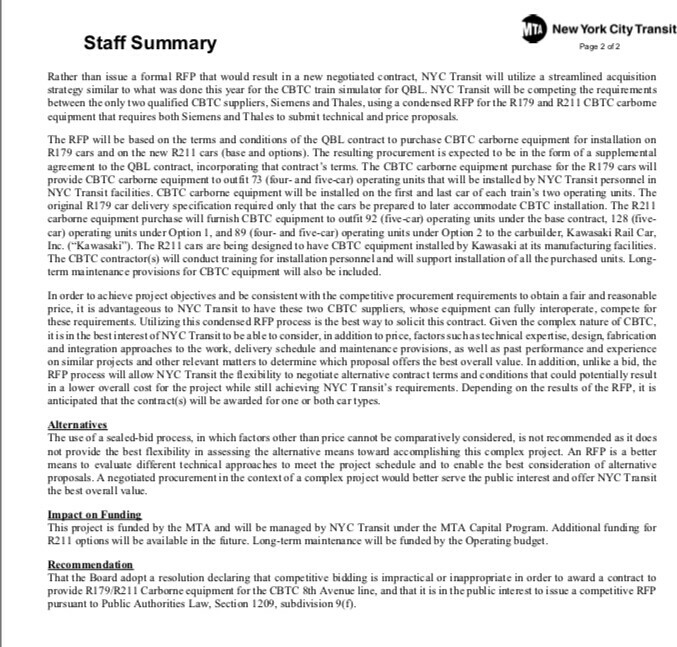 There will be 1537 new cars for NYCT, all CBTC-equipped, and 75 for SIR. There currently are 212 R143s and 64 R160s that are CBTC-equipped for Canarsie, there are 1,486 R160s in the process of being equipped with CBTC 309 sets (250 five-car units, and 59 four-car units) for Queens Blvd CBTC. The R32s (222 cars), R42s (50 cars), R46s (752=940 60 footers) are all going to be retired. These cars would increase the spare factor and serve as growth cars, allowing for increases in peak service, and could serve for extension such as the to Lefferts or to Brooklyn, or just for Second Avenue. The cars without CBTC would go to the Franklin Shuttle , the Jamaica Line , and the Broadway Line . Currently the uses 160 cars, of which 72 would be R160s, including spares. 160-72=88 cars needed. The 4-car sets that will make up the remainder of service will have CBTC-equipped, but will not be used. The Shuttle uses 4 cars+5 spares, and the N/W and Q would use the 616 R68/A cars (534 in rush hour service) in 4-car sets. The will use R68/As either now (with a three-way Jamaica, Concourse, CI swap) or will keep 40 R160s and get R46s from Jamaica, and then switch with Concourse and CI to get R68/As from the and which would get new cars for Sixth Avenue CBTC (R211s). The 4-car R211s (48 cars) could serve as growth cars for Canarsie alluded to in the last Capital Program, or could go the . You mean they'll have to suffer with the old 68s and 160s? Cry me a river. When we currently have cars dating back over 50 years still in service, I think riders will be able to handle cars 30 years younger than that. There is no way to have 89 sets and 333 cars if the sets are a mix of 4-car and 5-car units, meaning that they will go with the high number. 89(4) = 356, which is already more than the minimum. Therefore, there will be 81 sets of 5-car units, and 8 sets of 4-car units, making 405 cars in 5-car sets, and 32 cars in 4-car sets, all equipped with CBTC. The 4-car R211s (32 cars) could serve as growth cars for Canarsie alluded to in the last Capital Program, or could go the . I was in a rush to get this done before Shabbat came in. There are a few errors, which I fixed in red. Welp, this is going to be some useful info. So from what I understand, R179's aren't going to stay on the and for long and could possibly go to the . Interesting, so in the next decade or so, assignments on the B division should look like this? uses R211's (CBTC equipped). Does this mean that no 68A's would remain on the ? (since it's fully CBTC equipped) uses ALL R143's. It could share 4 car R160's with the along with the 4 car R211's. and the Franklin Avenue all use R68/68A's and nothing else since these lines are not getting CBTC right away. * 7-8 more trains added to terminate/originate at 96 Street. trains would get a 5-8 TPH increase to Astoria in place of the 's sent to 96. If that is not enough, then yoy could send 2 ttains to Astoria. This'll ease the bottleneck of the 34th Street interlocking and would help Broadway a whole lot in terms of Service. * trains can be extend to 18th Avenue and Terminate. It's likely to get a service increase so might as well send 1/3 of ALL trains express. * trains can short turn at Second Avenue or extend to Jamaica-179th Street since not all trains can run to Metropolitan Avenue due to the Williamsburg Bridge bottleneck and the Myrtle Bottleneck unless these issues were fixed. Concerning the R179s, that is just speculation. I have not spoken to anyone about this. I am just guessing based on car assignments and the CBTC timeline. Don't take this as a fact. Just as a thought out and reasonable assumption. Don't start rumors that will get out of control. This is likely going to happen. The R179s could be moved elsewhere so that the A/C are completely R211s later on. Something to remember is that once the R211s are in, any Mainline B Division Line will be able to use R160s (I expect the remaining 112 cars to get equipped), R179s and R211s. The cars might be switched around so it is easier for shops to do maintenance, or for capacity reasons. For instance, R211Ts could go to Jamaica. In addition, R68As could stay on the until 6th Avenue CBTC is done, whenever that is. This is possible, but I am not sure whether the R211s will be able to operate on Mainline B Division CBTC and Canarsie CBTC. I don't know the plans, which are likely still up in the air. I suspect they will be using R179s, but I can't say. Some R179s will almost certainly remain on the . They are four-cars after all. The , unless it is permanently going 8-car, should need so many cars. I would suspect that the R211s in 4-car sets go to the . The 2015-2019 growth cars are expected to be used for additional service on the E, G, L, and N lines, although these service plans remain subject to change. It will not share the 4-cars with the . These two kinds of CBTC are not compatible. This could change with the acceleration of CBTC. So, the will be getting R211s if they exercise option 2? Meaning there is still a possibility. Besides, speculation is just speculation at the end of the day and not everything that is said to happen will actually happen.